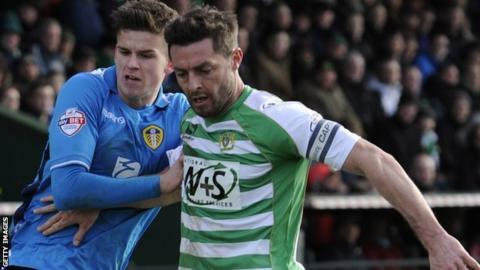 Veteran defender Jamie McAllister says he has no intention of retiring and wants a new deal with League One-bound Yeovil Town. Centre-back McAllister turns 36 on Saturday and his Glovers contract is due to end in the summer. "I'm fit and raring to go. Age is just a number to me," he told BBC Somerset. "I've enjoyed this season and played 38 games so I want to keep going. Hopefully I can have a chat to the gaffer as I want to stay here." Former Aberdeen man McAllister joined Yeovil in 2012 following his release from Bristol City, where he played under Glovers boss Gary Johnson. The Scotsman has made 82 appearances for the club and captained them to promotion to the Championship last season. However, Yeovil are on the verge of relegation back to League One and their fate could be confirmed if they lose at Brighton on Friday. And Johnson has said he will look at reshaping his squad after their game at the Amex Stadium. "We will get this game out the way because it's important they focus on the games," Johnson said. "We haven't yet sat down as a staff and worked out who will be with us and who won't. "There will be some out of contract that we still want to be here and some in contract we don't want to be here. "Those players will have will have to find a club over the summer, otherwise they will find themselves here on contract and not playing. "We're going back to League One so we have got to rebuild because that's natural. It's probably more than 50% that we want to keep."